"My husband stayed home from work because our dog was coughing. We took him to the vet and paid $85 for him to tell us OUR DOG WAS FAKE COUGHING! Sullivan is a 1 1/2 year old border collie mix. He is your typical dog—happy, playful, energetic, cuddly, needy and really smart. He loves the dog park, going for hikes, chomping on bones, and people (he LOVES people). His cough started about a week ago. We try really hard to not leave him alone for more than three-four hours at a time. I was substitute teaching that day and came home for a quick lunch and some Sullivan cuddles. Right when I was about to leave back to the school, he started doing this really scary cough/clearing of throat/ choking noise. And it really freaked me out. I started frantically googling dog CPR and tried looking down his throat, all while he was acting completely normal. He was wagging his tail and running around and just wanted to play but also kept making this horrific noise. I called my husband freaking out and told him what was happening and that I needed to leave for work but didn’t want to leave him alone, so my husband rushed home to be with him. After my husband came home, he stopped. No coughing. He was completely fine through the afternoon, evening and nighttime. So, we figured he must have just gotten something stuck in his throat and finally got it out. Except, the next morning when we both started getting ready for work, he started doing it again. My husband decided he would work from home that day and take him to the vet that afternoon. The vet thought he might have kennel cough because we take him to the dog park multiple times a week; so he got a bunch of tests done and the results came back that he was the epitome of health. He didn’t have a temperature or any symptoms. The vet was confused. He did give us some antibiotics just in case Sully had a bacterial infection. My husband and Sully went home and he hasn’t coughed since the vet. We called around a few vets in our city and asked them for some ideas of what could have been happening. Almost all of them said he could be acting sick in the mornings or when we leave him because he knows. If he acts differently or sick we pay more attention to him and stay with him. The vets said it doesn’t happen a lot and that most of the time if your dog is acting sick they are, but a few really smart animals know how to use and abuse the system. After the vet, I think Sully knew that we knew he was a big old faker, so he stopped because he didn’t want to have to go to the vet again, ha! I’m actually not surprised at all that he could pull this off. He has been an insanely smart dog since we got him when he was a puppy. I think this has only made us appreciate Sullivan more (if that’s even possible). It reminded us of all those times when we were kids and faked sick so we could stay home, but in this case he wanted us to stay home. And it makes us a little bit more on our toes around him, if he’s capable of this deception and scamming, what else could he be planning, ha ha. Overall, we just learned dogs are awesome and they pick up on a lot more than I think we give them credit for, sometimes—another reason to love them!" 13 year old a Eliza Levy tries to get the Presidents attention. 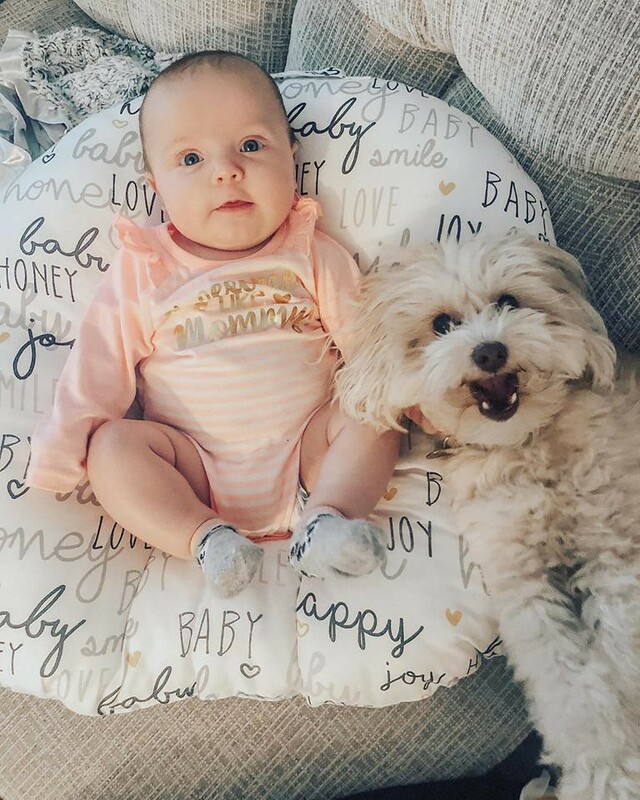 The Dog Has Had It With the Baby Getting All the Attention. All he wanted was some friendly Ninja Advice on how to get along with the other Ninjas.